Crook Point is located in the Northern Channel Islands, within the Channel Islands National Marine Sanctuary, on San Miguel Island, California. This site is located in an Area of Special Biological Significance (San Miguel, Santa Rosa, and Santa Cruz Islands ASBS) in Channel Islands National Park. 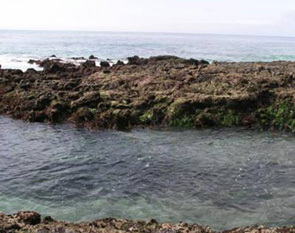 This site was established in the same location as one of the historic study sites used for a baseline study of the Southern California Bight (conducted by the Bureau of Land Management in 1978-79). The gently sloping site consists of extremely uneven terrain, containing many deep cracks and folds. Crook Point is dominated by consolidated sandstone bedrock, (some of which is quite soft in areas and easily eroded), and the area surrounding the site is comprised of a mixture of consolidated bedrock and sandy beach. The site is at the two western most outcrops of the series along the Crook Point area. All the outcrop peninsulas point southeast. The outer reef absorbs most of the impacts from the heavy south westerly swells that pound this area. While the inner reef is quite smooth, the outer reef is very pock marked with many pools and areas of very rough surface. Long-Term Monitoring Surveys at Crook Point were established in 1985, and are done by Channel Islands National Park. Long-Term MARINe surveys currently target the following species: Chthamalus/Balanus (Acorn Barnacles), Mytilus (California Mussel), Silvetia (Golden Rockweed), and Endocladia (Turfweed). In addition, motile invertebrates, mussel size structure, and water temperature are monitored at this site. Click here to view Long-Term trends at this site. Biodiversity Surveys were done by University of California Santa Cruz in 2001 and 2012. The Biodiversity Survey grid encompasses one section that is approximately 30 meters (along shore) x 20 meters (seaward). Click here to view Biodiversity Survey findings at this site. For more information about Crook Point, please contact Stephen Whitaker.